For the last three years, ADAD has worked in partnership with Sixty Plus, a local school and the local police and council to run a summer, Intergenerational project in the London Borough of Kensington and Chelsea. 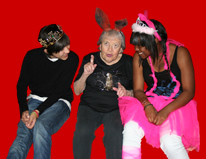 The project takes a mixed group of local over 60's and young people, through a three week devising and performance period. 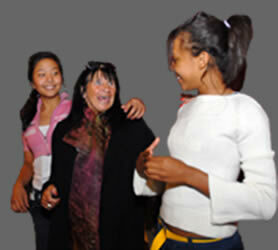 For the first week, using drama based exercises and techniques, the group look at issues that are important to them and their surrounding community. We then take their ideas and write a short performance piece, usually combining acting, singing and dancing (or whatever additional skills the group may have). Weeks 2 and 3 then become a rehearsal period for the workshop participants, leading up to 2 days of performances at a local venue, The Electric Cinema. The performances are free to the local community and are an opportunity for friends, family and members of the wider community to see their work.